Building on the already established cooperation between the master’s programmes PLEP (Bern), EELP (Bochum) and PELP (Graz) of the past years, another summer school took place from the 3rd to the 8th of June 2018 in the guest and conference house Lauchbühl (Grindelwald) in the Bernese Oberland. 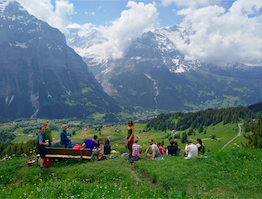 In the setting of the Swiss Alps, students and teachers alike had the opportunity to get to know each other, network, and discuss current issues in Political Philosophy in English. The main topics of the summer school were moral psychology and democratic theory, global poverty and consumer ethics, human rights as well as migration and the debate around international freedom of movement.